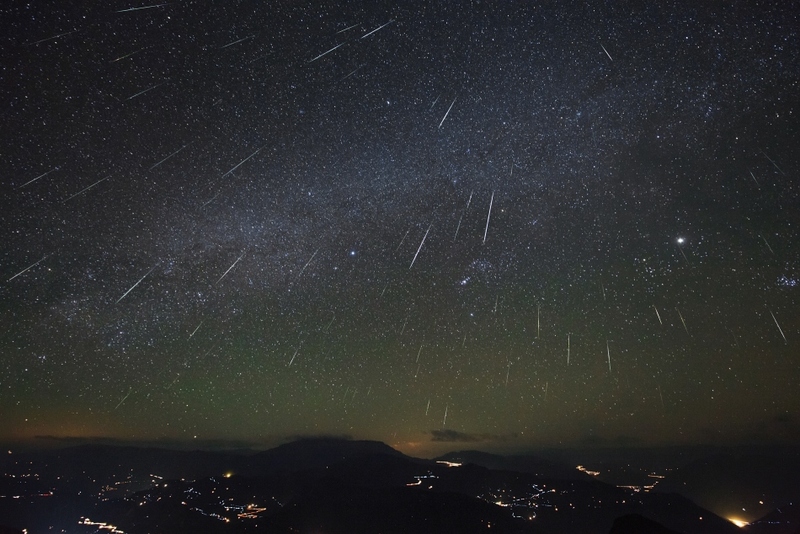 Explanation: The annual Geminid meteor shower is raining down on planet Earth this week. And despite the waxing gibbous moonlight, the reliable Geminids should be enjoyable tonight (night of December 13/14) near the shower's peak. Recorded near last year's peak in the early hours of December 14, 2012, this skyscape captures many of Gemini's lovely shooting stars. The careful composite of exposures was made during a three hour period overlooking the Dashanbao Wetlands in central China. Dark skies above are shared with bright Jupiter (right), Orion, (right of center) and the faint band of the Milky Way. The shower's radiant in the constellation Gemini, the apparent source of all the meteor streaks, lies just above the top of the frame. Dust swept up from the orbit of active asteroid 3200 Phaethon, Gemini's meteors enter the atmosphere traveling at about 22 kilometers per second.